RV or Motorhome or Campervan or Camper or Caravan? Some Definitions below. Recreational Vehicle, and its acronym RV, are generally used to refer to an enclosed piece of equipment dually used as both a vehicle and a temporary travel home. This primarily a term used in the USA and Canada - Motorhome would be a more universally understood amongst english speaking nations. Motorhome, Motor home - same as Recreational Vehicle (RV) - a small bus or trucklike vehicle with a roomlike area behind the driver's seat outfitted as living quarters. (Same as Travel Trailer) trailer towed behind a road vehicle to provide a place to sleep which is more comfortable and protected than a tent. It provides the means for people to have their own home on a journey or a holiday, without relying on a motel or hotel, and enables them to stay in places where none is available. Constructed on either a commercial truck chassis, a specially designed motor vehicle chassis, or a commercial bus chassis. Built using a conventional van, to which either a raised roof has been added or had the back replaced by a low-profile body (aka coach-built). Class B recreational vehicles are commonly known as Dormobiles or caravanettes in the UK, or as 'Kombis' in Australia and other countries. This trend started in the 1950's after Volkswagen commissioned the Westfalia company to use the Kombi version of their Type 2 transporter as the basis for a campervan. 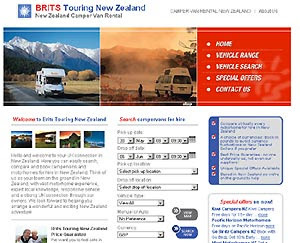 Hiring Campervans in Australia are a very popular way of seeing the country. Built on a truck chassis with an attached cab section, which is usually van based, but may also be pickup truck based or even large truck based. They are characterized by a distinctive cab-over profile, the "cab-over" containing a bed or an "entertainment" section. Also referred to as "mini-motorhomes". In the UK, the cab-over is known as a Luton. A unit that is temporarily let into the bed or chassis of a pickup truck. These are much favored by hunters and other backwoods travelers, particularly in North America. Camper Hire are popular South Africa to handle the rougher driving conditions. Also known as a pop-up or tent camper, a light-weight unit with sides that collapse for towing and storage. Suitable for towing by many vehicles. A compact, lightweight travel trailer that resembles a teardrop, sometimes seen being towed by motorcycles. This is a standard travel trailer that is not self-contained. It is designed for park camping only, and while it is easily moved from site to site, as a normal trailer is, it is not capable of "dry camping" as it does not have any water storage tanks and must be used with hookups. It is not a mobile home. An uncommon term indicating a motorhome built around a semi truck chassis (such as a Freightliner). This type of motor home allows the pulling of large and heavy trailers. A motorhome, 5th-wheel, or travel trailer, it is designed to be part living space, and part garage for storing things such as motorcycles and ATVs.